I note from the local press that the saga of Michael Fabricant, Lichfield Council and the amazing failing dam continue unabated. Coverage has ranged from the plaintive screech of the frankly alarmist to the more measured, with some excellent coverage by the Lichfield Blog. Michael Fabricant chose to reply to me personally on this article, to which I have responded I include the exchange here as I feel the debate needs to take place in as wide an arena as possible. Meanwhile, back in the real word, there have been updates to Lichfield Council’s Chasewater Dam Blog, and this week the valves were opened for the final draining of the lake before work commences in the spring. Right, lets cut the cobblers, and address a few points here. i’ll address the member personally, if I may. I’ve been tracking progress of this issue for months on Brownhills Blog. As I have stated all along, I believe Lichfield Council should be helped with the cost of the dam upgrade. This shouldn’t come directly from the government, but from the partners with an interest, like British Waterways. I believe the way to achieve this is always through quiet diplomacy, rather than scaremongering. Michael, (I) would be grateful if you and your mates at the council would credit some of the observers of this melee with the technical skill and ability to understand what’s going on with the dam. I’ve seen the report; there is next to no danger of the dam bursting in the immediate term. 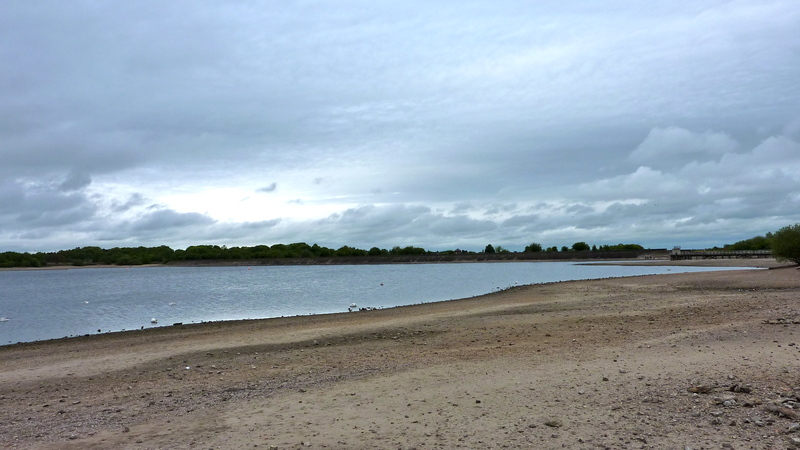 If there had been any such danger, that lake would have been drained quicker than you could say controversy – as it is, a low water level has been maintained for the past 18 months or so, and planned work is ongoing, with the drawdown having commenced this week. Engineers are in charge of this. They know what they’re doing. All earth dams leak, and erosion is an understood, controllable effect. Upgrades to the retention structures at Chasewater are necessary and desirable, as they are with several hundred other such facilities in the country. These works will ensure continued safety in the event of freak weather events, and provide many years of further service for this important reservoir. That the report recommending them contained the very worst case scenarios does not mean they’re impending, likely or probable.Your histrionic, alarmist statements about scores being killed contributed nothing whatsoever to rational debate on the subject, and instead have caused alarm and distress to a good many local residents, whilst achieving a predictably negative response from the government. Since your ill-advised cry of ‘Fire’, my blog has been continually hit by searches based on terms like ‘Chasewater death toll’, ‘Chasewater dam burst’ and the like. At no point did you consider it necessary to point out to your distressed and incredulous audience that the works were due to start as planned, exactly has they had been for months, and that there was no real cause for panic. Instead, the local press, TV and other media parroted your shrill mantra that doom was a hairs-breadth away. This was neither sensible or productive. In the midst of this manufactured storm, you chose to play party politics, which was also regrettable. I suspect the faux-hurt you claim to feel was more to do with the precision of the uncharacteristically observant snipe by Gordon Brown to you at question time. I suspect the Christian Aid lot have been pushing him steroids, he’s normally as sharp as a marble. You’ve wheeled out a lot of hairy old chestnuts in this affair, including lofty accusations of inaccuracy addressed at myself and Steve Norman, but never actually pointing them out; you’ve made loft allusions to the USSR and also a claim that you’re only repeating what you’ve been told. I note you’ve also wheeled out the tired ‘lurkers support me in private’ defence, which didn’t work on Usenet in 1996, nor on web fora in 2003 and it certainly doesn’t wash here. Anecdote isn’t evidence, so please don’t insult our intelligence. I suspect you’ve probably done more harm than good, but your modus operandi has always been to sensationalise. I wish LDC well in their attempts to get assistance with this project, but scare tactics are ill advised, misjudged and regrettable, particularly to those of us who do indeed cherish the concept of truth. I thank the Lichfield Blog for allowing me the space to post this lengthy reply, which will also appear on the Brownhills Blog (just click my name at the top of this post). This entry was posted in Brownhills stuff, Chasewater, Environment, Express & Star, Followups, It makes me mad!, Just plain daft, Local media, Local politics, Shared media and tagged Brownhills, Chasewater, Chasewater Dam, Chasewater drainage, Chasewater Safety Works, Dam, Dam failure, earth dam, Express & Star, local blogs, Local politics, Michael Fabricant, planning, Reservoir, Silly, Staffordshire, The Lichfield Blog, Wildlife. Bookmark the permalink. Fancy that, a politician called Fabricant fabricating. How very very amusing. Michael, please leave the engineering to engineers, and stick to talking about things you know something about. I’ll leave you to decide what those subjects might be. HTH. I’ve just noticed (via his site) that Michael *is* an engineer, and it seems he has written papers for the IEE’s publications, so really my comment should suggest that he gives us a nice talk about power factor correction or suchlike, instead of dams.